The colors of Antelope Canyon are unparalleled – as the sun slowly climbed into the desert sky, the reflections of the growing light off the walls of the slot canyon glow blue, purple, red, pink, orange, and yellow. 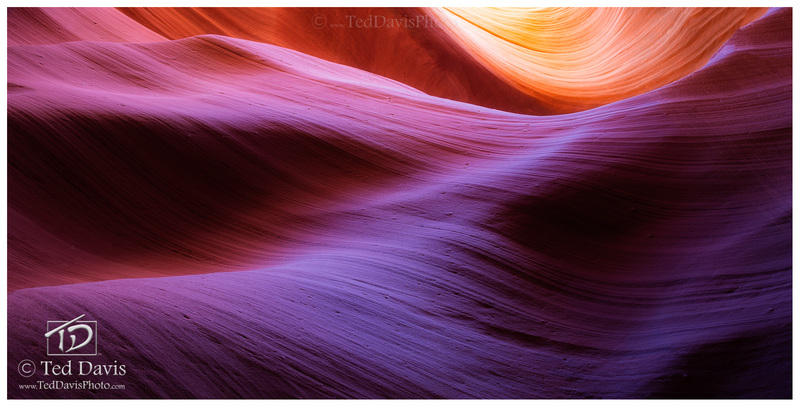 The "waves" that have been formed over time by rushing waters and flash floods allow the canyon walls to flawlessly flow from color to color. When I found these waves in the Lower Canyon, I knew I had to get this shot. With the sun cresting over the sides of the canyon and beginning to light up more of the canyon floor, I realized the yellows would soon be burned away and I would lose the smooth transition of the pinks to purples. I acted quickly and snapped the shot. Bloom is the reawakening of a new day, the promise that after a long night the beauty thought lost, will once again blossom. Photo © copyright by Ted Davis.